The cage welding machine is used in manufacturing of reinforcement cages used in construction of manholes and concrete pipe manufacturing industry. Over time, MBK Company has become a global leader in manufacturing of the MBK cage welding machines. The wire cage welding machine is manufactured to meet high productivity demands by their users, maximum flexibility, precision and straight cages required during concrete pipe construction. The concrete pipe cage machine is fully automatic with wire feeding system designed for smooth and efficient discharge. This longitudinal wire feed of coil completely eliminates stock holding of the pre-cut bars and also facilitates uninterrupted cage production, leading to higher output than the convectional machinery. This system is made in sync with the welding process in consideration of the fact that the longitudinal wires are required of different lengths. The chain conveyor that automatically receive the cut bars and transfer them to longitudinal wire feed. The equipment uses an efficient welding transformer of 116 kVA / 50% ED and has a momentary peak power input of 300 kVA during welding. The cage production equipment is specially designed to produce smaller cross section concrete pipes as well as the larger dimension pipes and incompliance with the industry standards. The diameter of the cages may vary from 340mm to 4400 mm and can have up to 36 longitudinal wires. The incorporation of an inverter welding unit leads to an extremely low power consumption level, allows smooth loading of power mains and creates uniformity in the final weld while still guaranteeing lower spark formation. For a completely trouble free de-coiling during production, the wire cage welding machine utilizes layer wound coils. The smooth or the deformed reinforcement wire is the most preferred for resistance spot welding. 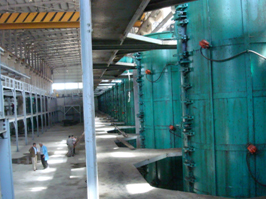 Better performance is also achieved when using a wire free of scale and corrosion and other impurities. The use of an automatic cage removal cart also enables easy unloading of the completed cage. Through innovation, the company has also developed a cage welding machine able to weld square reinforcement cages for driven and bored piles, columns and beams with or without a cone. With all these automated components, the concrete cage production equipment has been described as robust and easy to use machinery with striking operational features. The MBK Company has developed various innovative models of the cage making machine to address various requirements of the users. The demand for the cage welding continues to grow in all parts of the world and mainly boosted by the rapid infrastructural project around the world.